Supra Boats @SupraBoats dealer Idaho Water Sports Presents Wake in the Snake 2014. July 12th, sponsored in part by Supra Boats. Grassroots Wakeboard Competition held on the Snake River in Burley, ID. 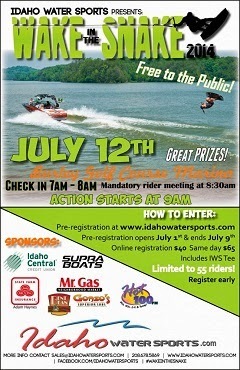 Online pre-registration is required at www.idahowatersports.com by July 8th in order to keep the comp running smoothly. Registration fee includes IWS tee. Limited to 55 riders! Register early. Registration opens July 1st. Food will be sold on site. All riders must check in 7am to 8am. Mandatory riders meeting at 8:30am.